On Friday 10th May, Dr Stockwell kindly gave up his early evening to take the Year 13 Physics students on a tour of Chorley Hospital’s medical imaging department. On arrival the students were taken to the X-ray department where the students were dressed from head to toe in lead-lined clothing and, huddled behind a protective screen, and in real time a 3D image a phantom body was produced, showing many objects hidden within. It was then the turn of the students to experience the physical difficulties involved in operating in such an environment. 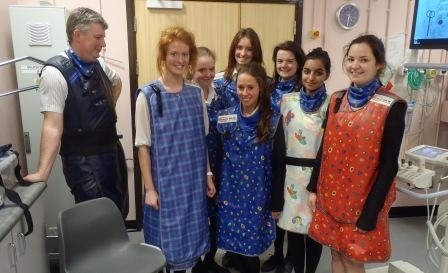 Students were dressed in lead-lined aprons, thyroid protection, heavy glasses and gloves – the result being that even some of the more sporty students were struggling to stand upright after only a few minutes. With protective clothing removed, students were informed about the difficulties of imaging the digestive tract and were given barium ”˜shots’ to drink. Some girls enjoyed the experience more than others, but there was no doubt at all that the thick white liquid stuck to everything – teeth and tongues turned white for a disconcertingly long time! Having learnt to use X-rays to image soft tissue, girls could begin to discuss diagnosis and treatment. They were then shown how stents worked and how they could be placed carefully in all parts of the body in order to hold open airways, blood vessels and other tubular structures. Dr Stockwell then wheeled in an ultrasound device immediately showing how portable these machines are. With gel applied, he showe3d us the blood flow through his carotid artery and how to measure the speed of flow using Doppler shift. Following on from this, students saw the amazing advantage of CT scans and the very latest in technology, the PETCT. This machine combines PET scans with CT to clearly identify cancerous areas of tissue which could have been missed with previous techniques. Two hours had flown by and it was time to leave. Dr Stockwell’s informative tour had brought to life the theory learnt at school and provided the students with an opportunity they will never forget.